Since 1997, the Palau de la Música Catalana has been on the UNESCO World Heritage List. The modernistic building is located in the northern part of the old town. The concert hall of the music palace is particularly impressive. The architect was Lluís Domènech i Montaner, who built some important Art Nouveau buildings in Barcelona. Visit the Orfeó Catala rehearsal room, where the foundation stone of the building is located, continue along the staircase with flowers and ferns made of stone, iron and glass, visit the Lluís Millet Hall, a homage to nature and, as a highlight, visit the Concert Hall with its world famous glass roof. The organ accompanies you in the hall on a musical journey. Due to shows and rehearsals, individual tours may be canceled. Simply enter the number of people you would like to book for, then select the date and click on "Add to cart"
The Catalan choir association "Orfeo Catala", founded in 1891, gave the order to build Palau de la Música Catalana. The Music Palace was built starting in 1905 and was inaugurated in 1908. The rapid development of Catalonia in the late 19th century produced a well-to-do bourgeoisie, which sought new forms of self-expression. Modernisme became an essential means of expression for this rising bourgeoisie. The central element of the Modernisme is the combination of various art forms - such as sculptures, blacksmithing, ceramics and glass art - as well as different architectural styles. This mixture of art forms can be seen clearly at Palau de la Música. Palau de la Música was designed by Lluís Domènech i Montaner, one of the most important representatives of the Modernisme and at the time the most renowned architect in Barcelona. The order came from the choir association "Orfeó Català", an amateur music club founded in 1891, performing sophisticated works and enjoying great popularity in Barcelona at the turn of the century. The Music Palace was built from 1905 and inaugurated in 1908. The building was financed by donations from wealthy merchants and industrialists. The facade is adorned with mosaic-decorated columns, each of which has a different floral pattern. Busts of great masters such as Beethoven, Bach and Wagner bear witness to the prevailing taste in music. At one corner there is a sculpture dedicated to the Catalan folk song, dominated by the patron saint of Catalonia, Sant Jordi. Gothic and Moorish architectural elements have also been incorporated into the design of the facade. The highlight is the impressive concert hall. Hall and stage form a harmonious unity. Unusual building materials were used: Lots of glass makes the music palace very bright and gives it a very own mood. The light shines through colorful glass windows and an arched, glassy and colorful dome. On the walls you can see sculptures of 16 muses playing different musical instruments from different countries and regions. They symbolize the different musical styles and embody the spirit of the Palau de la Música Catalana - a performance venue where every musical genre should find its place. To the left and right of the stage are two other imposing sculptures symbolizing folk and classical music. The decorative elements of ceramic with natural forms are also very characteristic of the Modernism. A church organ, which can be heard again after a restoration in 2004, is located above the stage. In the 1980s, the Palau de la Música Catalana was rebuilt and modernized under the direction of architect Óscar Tusquets. 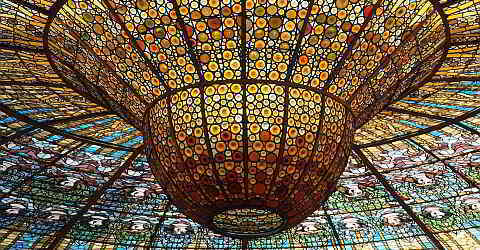 Even after the restoration the Palau de la Música Catalana still has its original charm. According to Lluís Domènech i Montaner, the Palau de la Música Catalana is supposed to be a "garden for music". Immerse yourself in this "musical garden" and be enchanted by the richness of detail of this extraordinary building. Please enter the number of people you would like to book for. Reduced price for pupils, students, pensioners. The Palau de la Música can only be visited with a guided tour. The number of participants is limited. We recommend to book the tour in advance.